Peptide libraries are widely applied as a powerful tool in biological research. They provide a rapid and cost-effective solution for a broad range of bioactivity-screening purposes, identifying critical bioactive peptides. Dedicated libraries of small peptides are ideal for T-cell epitope mapping & searching. Overlapping linear peptide libraries provide a quick route to mapping of the linear or complex epitope of your antibody. Peptide libraries are also used in biochemical studies as enzyme substrates, ligands or inhibitors. Pepscan offers custom peptide arrays in all sizes and formats, ranging from a small set of peptides to libraries of 1,000’s of different species. Peptide lengths usually range from 5 to 30 amino acids, which is sufficient for most applications. 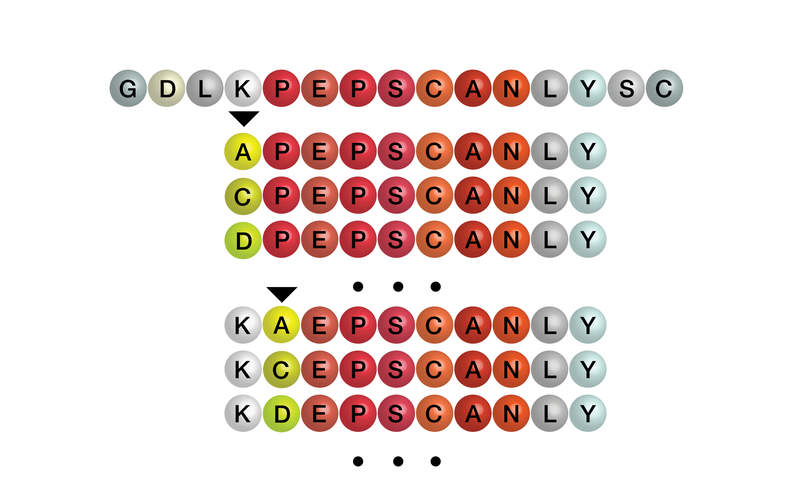 However, as the inventor of the peptide library concept, Pepscan also supplies peptide libraries of up to 50 amino acids in length, if required with conformational constraints or post-translational modifications. Peptide libraries are manufactured on Pepscan’s state-of-the-art synthesis platform, usually at 4 μmol scale. This typically yields 1 to 4 mgs of crude peptide, ideal for fast and efficient screening work. Additional QC is available upon request. Typically, synthesis starts within days of order placement, with standard delivery times of around 3-4 weeks, depending on library size and peptide length. Custom peptide libraries are delivered as freeze-dried peptides in either 96-well plates for high-throughput screening or in individual microtubes. All peptides in the library will be delivered as TFA-salts as lyophilized powders. 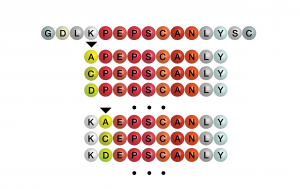 Upon request, we produce peptide libraries with different structural modifications, such as N-terminal acetylation, biotinylation, Ser/Thr-phosphorylation, N-methylation, or labeling with fluorescent dyes. Please contact us for further information about custom modifications. 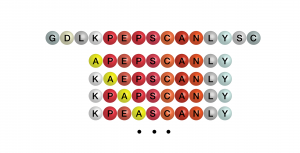 At Pepscan, we have been designing, synthesizing and applying peptide array technology for many years. You can tap into this knowledge by using our free design assistance service. We provide recommendations to create the most efficient and economical library design and help you to compute lists of peptide library sequences. When the 3D-conformation of your peptide is crucial, we also offer unique libraries of 3D-constrained (CLIPS) peptides. A range of library design options are available (overlapping, truncated, T-cell truncated, alanine scan, replacement analysis, combinatorial positional scan, scrambled), each tailored to address specific research questions. Please feel free to contact our experts for advice in designing your optimal peptide array. If your library has already been designed by yourself, just send us a quote request with an Excel file containing the peptide sequences and we will check them for feasibility. 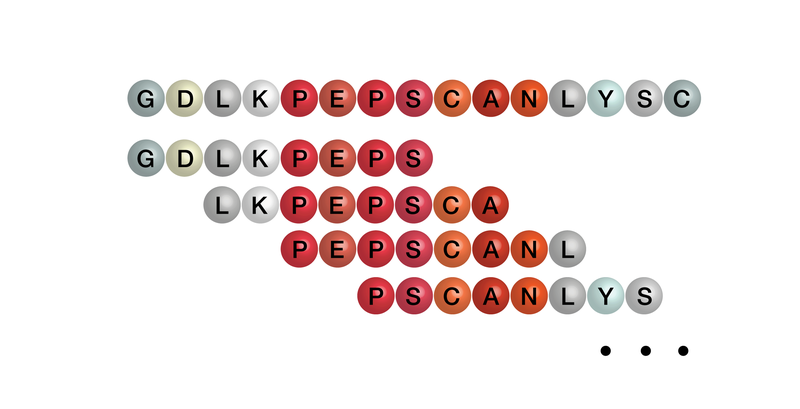 Pepscan is the founder of peptide library technology and our staff has been designing peptide libraries for many years. Please feel free to contact the Pepscan experts for free design assistance. Alanine scanning libraries are used to identify residues that play a role in the activity of a peptide. Alanine, the smallest chiral natural amino acid, is used to substitute residues at each position of the original peptide. The effect of alanine substitution on the overall peptide activity is used to determine the importance of each individual residue. Positional Scanning Library screening is a key method for sequence optimization. By sequentially substituting selected amino acid residues by all other natural amino acids, residues important for activity are identified and a sequence with improved activity can be designed. Combinatorial Positional Scanning Libraries are an extension of the Positional Scanning Libraries, varying systematically 2 or more positions at a time. 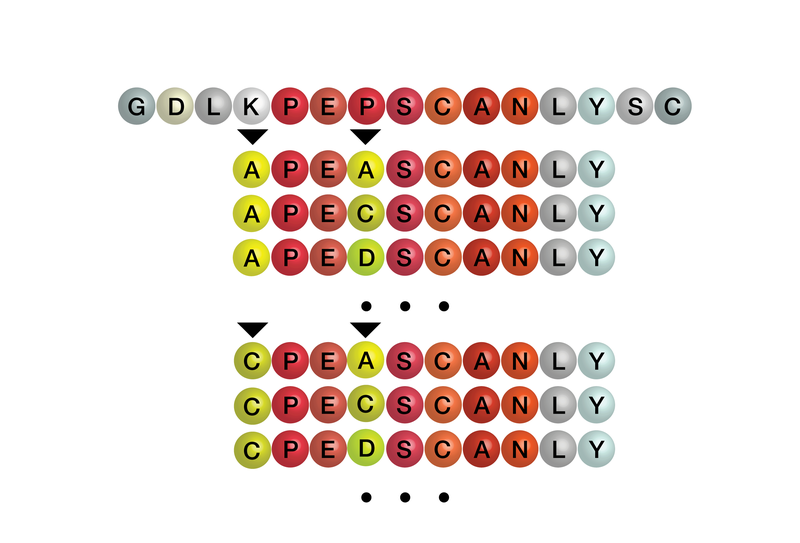 These libraries allow identification of more complex effects of multiple positions on the biological activity of a peptide sequence. Scrambled Libraries are used to screen all or many permutations of a specific amino acid composition or as a negative control for a specific peptide to show that its sequence is critical for activity. 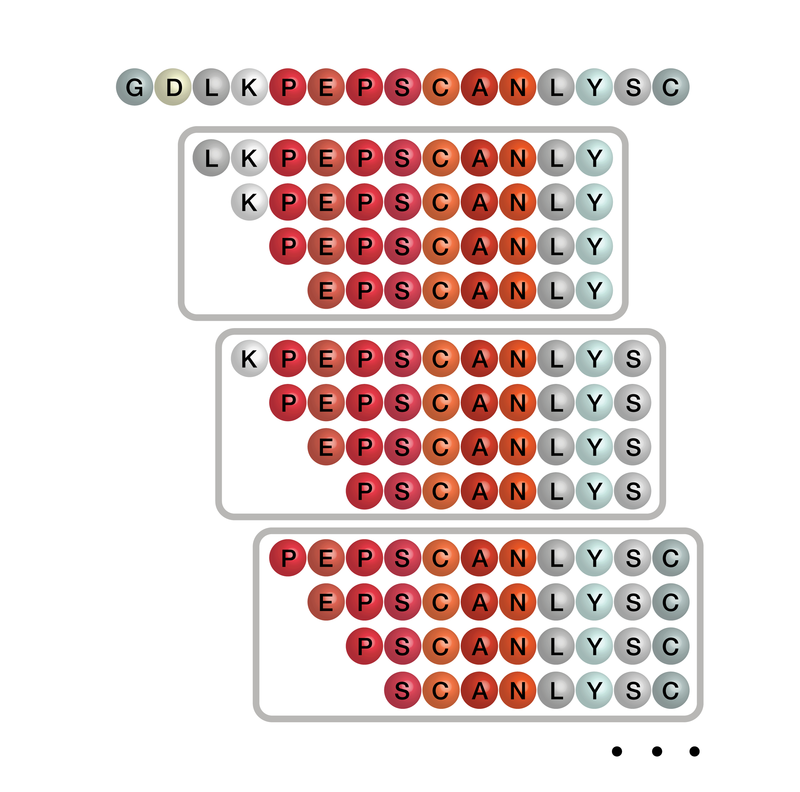 Overlapping peptide libraries are used for scanning the primary sequence of proteins for linear epitopes. They are also ideal for T-cell epitope identification, because these epitopes are by nature short linear peptides from the primary protein sequence. The peptide library generation process is defined by two parameters: peptide length and offset number (the degree of overlapping). Careful adjustment of these parameters guarantees the best value for specific library applications. Truncated libraries are designed by systematically removing flanking sequences of an active sequence core. Their purpose is to identify the shortest amino acid sequence needed for activity. If the essential amino acids have been identified by Alanine scanning or other technologies, truncations can be tailored around these key amino acid residues. 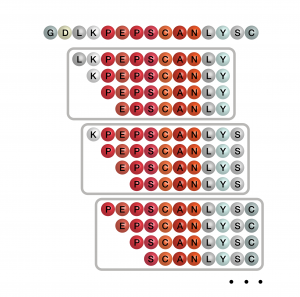 T-cell truncated peptide libraries are a combination of overlapping and truncated library design, allowing high-resolution identification of T cell epitopes. 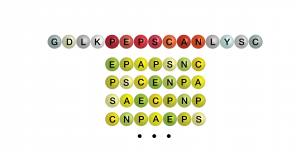 Equimolar mixtures of the four C-terminal peptides for each nominal 11-mer are provided in each tube (i.e. all 8 to 11-mers). The results are analyzed to obtain precise epitope identification with significantly less assays as compared to overlapping peptide libraries. In order to identify peptides that mimic the native 3D-spatial structure of proteins, linear peptides are not always sufficient. Pepscan developed CLIPS constraining technology, which enables the 3D-structural fixation of peptides. 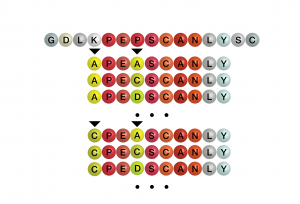 Constrained peptides have proven to deliver improved binding affinities, selectivities and/or proteolytic stabilities. Unlike other constraining methods, CLIPS-chemistry can create not only mono-, but also bi- or tri-cyclic formats. Direct functional screening of large libraries of CLIPS peptides against the target of interest is an efficient tool to discover CLIPS peptide leads. Pepscan makes Hit Seeker libraries of up to 20,000 CLIPS peptides available to third parties for screening against targets of their interest. 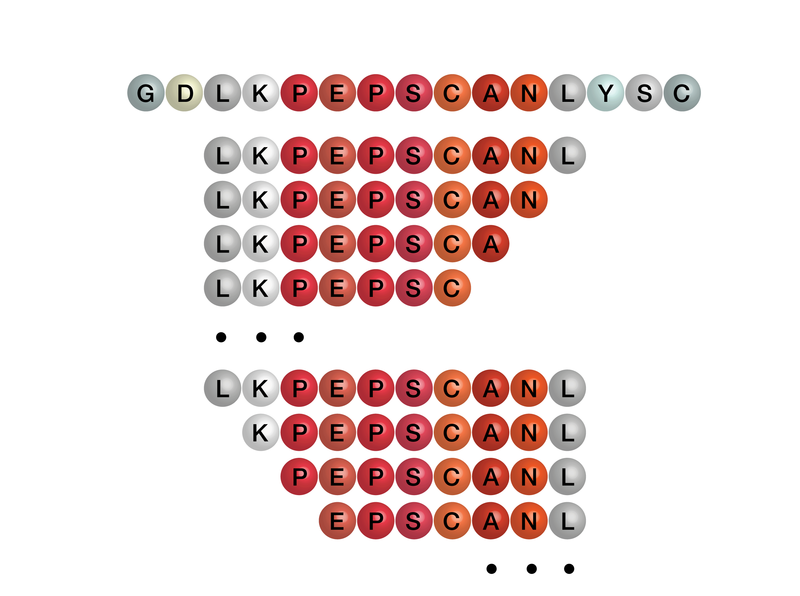 Pepscan provides CLIPS peptide libraries tailored to your specific needs. They can be designed to include pre-defined target-specific structural information or be made fully random. Please contact the Pepscan experts for further information. Bentzen et al: Nat. Biotechnol (2016) – PMID: 27571370. Large-scale detection of antigen-specific T cells using peptide-MHC-I multimers labeled with DNA barcodes. Clement et al: Sci Rep (2016) - PMID: 27748447. Targeted suppression of autoreactive CD8(+) T-cell activation using blocking anti-CD8 antibodies. Gayatri et al: Sci Rep (2016) - PMID: 27338245. Using oriented peptide array libraries to evaluate methylarginine-specific antibodies and arginine methyltransferase substrate motifs. Szomolay et al: Immunol. Cell Biol (2016) – PMID: 26846725. Identification of human viral protein-derived ligands recognized by individual MHCI-restricted T-cell receptors. Verbandt et al: Mech. Ageing Dev (2016) - PMID: 27491841. Identification of survival-promoting OSIP108 peptide variants and their internalization in human cells. Baggio et al: ChemMedChem (2016) – PMID: 27144715. The Cell Surface Receptor CD44: NMR-Based Characterization of Putative Ligands. Aw-Yong et al: PLoS ONE (2016) – PMID: 27806091. Immunodominant IgM and IgG Epitopes Recognized by Antibodies Induced in Enterovirus A71-Associated Hand, Foot and Mouth Disease Patients. Bulavaitė et al: Appl. Microbiol. Biotechnol (2016) - PMID: 26821928. Synthesis of human parainfluenza virus 2 nucleocapsid protein in yeast as nucleocapsid-like particles and investigation of its antigenic structure. Bottini et al: ChemMedChem (2016 )- PMID: 26592695. High-Throughput Screening (HTS) by NMR Guided Identification of Novel Agents Targeting the Protein Docking Domain of YopH. Motozono et al: Clin. Exp. Immunol (2015) – PMID: 25721491. Clonotypically similar hybrid αβ T cell receptors can exhibit markedly different surface expression, antigen specificity and cross-reactivity. Bottini et al: Chem. Biol. Drug Des(2015) – PMID: 25676805. Targeting influenza a virus RNA promoter. Please fill out a quote request form. One of our experts will be in contact with you shortly. Copyright Pepscan 2015, all rights reserved.